The Candy Maier Scholarship Fund for Women Writers supports participation in shared writing experiences. 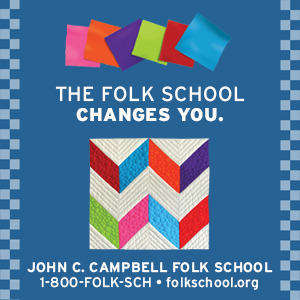 It provides scholarship assistance to women living in Western North Carolina for workshops, classes, program and retreats located in Western North Carolina or in nearby areas of contiguous states. Writing friends of Candy Maier established The Candy Fund (TCF) in 2006, after her unexpected death in November of 2005, to honor her life and the kind of writing experiences she found fun and meaningful. In TCF’s first three award years, more than fifty women received scholarships. These women are already giving back to the community of writers. Awards are made each month, year-round, as funds permit. Sales of the fabric art will be important in our current funding, and we invite you to consider a purchase of one of these beautiful pieces. Please contact Cheryl Dietrich, 828-277-1757, cheryldietrich@bellsouth.net, for further information or to see the any of the fabric art. The one-of-a-kind pieces marry traditional quilting techniques with layers of landscape, figures and words. The varied and vibrant colors originate from hand preparation/dying of the fabrics. From a drawing by Kimberly at the Morikami Japanese museum. 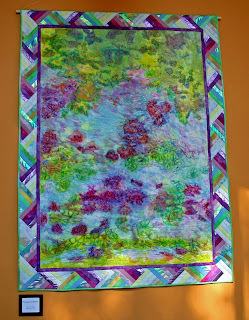 Kimberly Childs is nationally known for her quilted fabric art and garments. Her themes range from personal serendipity to Florida (“Park Scene II”) and the Southwest. 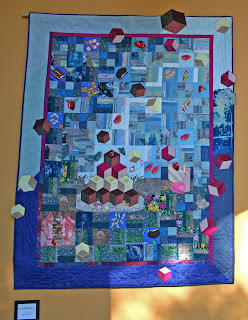 After many years as a fabric artist, health challenges now prevent her from executing further pieces. She now uses her writing and watercolor painting to express herself. 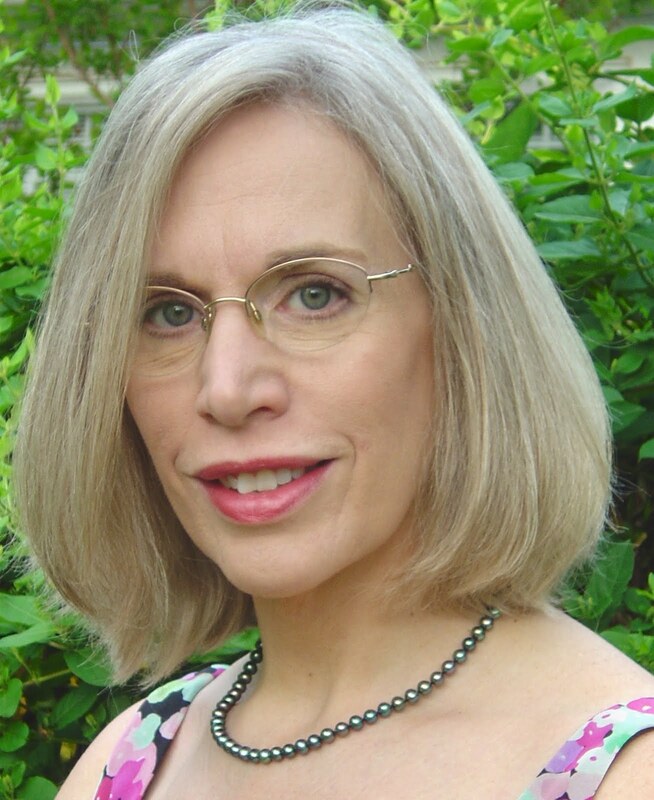 Kimberly lives in Asheville where she is an active member of the community of women writers. Her donation of fabric art for the support of the scholarship program has been greatly appreciated by The Candy Fund Board. The Candy Maier Scholarship Fund for Women Writers and the First Congregational United Church of Christ team up to display "Nature's Patchwork," an exhibit featuring the fabric art of Kimberly Childs, in the church gallery June 7-30, 2009. The exhibit opens at 11:00 a.m. following morning services on Sunday June 7, 2009, in the church’s gallery hall. The church will be open from 1-5 pm on Tuesday June 9th, Friday June 12, Friday June 19, and Friday June 26, 2009 so the public can view the artworks, speak with the artist and board members of The Candy Maier Scholarship Fund for Women Writers. The exhibit features nine artworks within the theme of “Nature’s Patchwork”, titled, Park Scene I, Park Scene II, a 2-piece set of a different Park Scenes I & II, “Plenitessa-Kitchen Goddess”, “Feeding Koi”, “Words Words Words”, “Sweet Abundance” and “Homage To Monet”. Child’s pieces are vibrantly colored works of fabric marrying artisanal traditional quilting techniques with layers of landscape, figures and words. 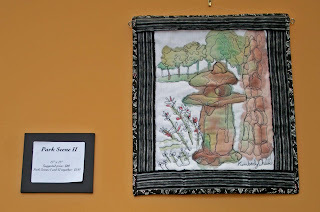 Kimberly Childs is nationally known for her quilted fabric art and garments. A love of contra dancing and singing inspired her creativity with many of her artworks, but health challenges forced her to give up the dancing and singing that fed her artist’s soul. Her hands can no longer work with fabrics, and surgical damage to her vocal cords has silenced her singing voice forever. Even though she now uses a portable voice amplifier and struggles to speak above a whisper; her indomitable spirit refuses to give up or feel sorry for herself. Kimberly refuses to silence her artistic voice, and uses writing and watercolor painting as newer ways of expressing her creativity. Kimberly wanted other women to experience the same comfort, joy and magic in writing that she and Candy Maier discovered on their artistic journeys. 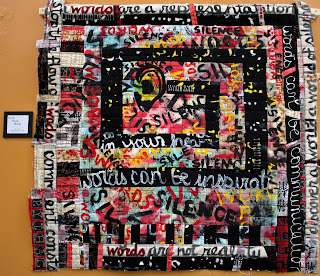 In 2007, she donated nine of her final fabric art pieces to The Candy Maier Scholarship Fund for Women Writers. All pieces exhibited at the church are available for sale, with proceeds benefitting The Candy Maier Scholarship Fund for Women Writers. Candy Maier, according to her many friends, always lit up a room with her presence, sharing with everyone her zest for living. Her stories were often poignant, funny and meaningful, bringing joy to others. After Candy’s sudden death in 2005, her writing friends created The Candy Maier Scholarship Fund for Women Writers, an IRS 501(c)3 non-profit organization, which grants scholarships to Western North Carolina women over age twenty-one for shared writing classes from private teachers, universities and other sources. 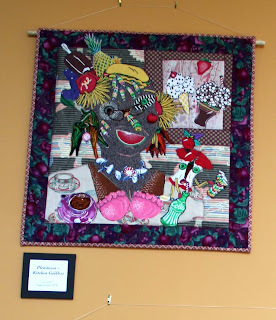 Proceeds from the sale of the “Nature’s Patchwork” artworks will provide Candy Maier writing class scholarships to other women living in Western North Carolina in continuation of Candy Maier’s legacy.